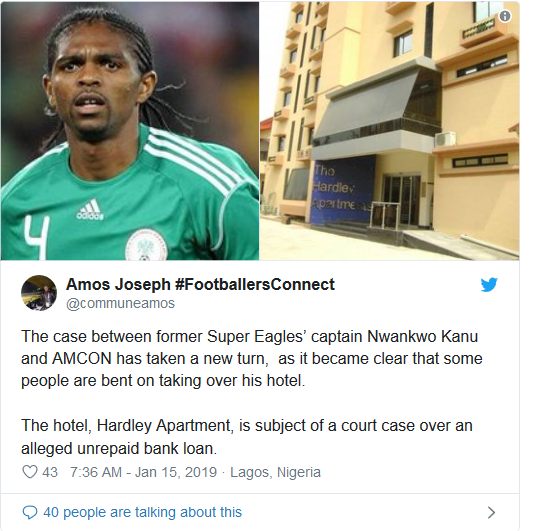 Former Super Eagle Striker, Kanu Nwankwo's Hotel Robbed, Carted Away Valuable Items. Home Sports Former Super Eagle Striker, Kanu Nwankwo’s Hotel Robbed, Carted Away Valuable Items. Former Super Eagle Striker, Kanu Nwankwo’s Hotel Robbed, Carted Away Valuable Items. Previous articlePresident Buhari Launched New Nigerian Passport With 10 Years Validity! Next articleInteresting: Members Of The British Parliaments Votes Against The EU Divorce Deal!